Networking hardware, also known as network equipment or computer networking devices, are physical devices which are required for communication and interaction between devices on a computer network. Specifically, they mediate data in a computer network. Units which are the last receiver or generate data are called hosts or data terminal equipment. Networking devices may include gateways, routers, network bridges, modems, wireless access points, networking cables, line drivers, switches, hubs, and repeaters; and may also include hybrid network devices such as multilayer switches, protocol converters, bridge routers, proxy servers, firewalls, network address translators, multiplexers, network interface controllers, wireless network interface controllers, ISDN terminal adapters and other related hardware. The most common kind of networking hardware today is a copper-based Ethernet adapter which is a standard inclusion on most modern computer systems. Wireless networking has become increasingly popular, especially for portable and handheld devices. Other networking hardware used in computers includes data center equipment (such as file servers, database servers and storage areas), network services (such as DNS, DHCP, email, etc.) as well as devices which assure content delivery. Gateway: an interface providing a compatibility between networks by converting transmission speeds, protocols, codes, or security measures. Router: a networking device that forwards data packets between computer networks. Routers perform the "traffic directing" functions on the Internet. A data packet is typically forwarded from one router to another through the networks that constitute the internetwork until it reaches its destination node. It works on OSI layer 3. Switch: a device that connects devices together on a computer network, by using packet switching to receive, process and forward data to the destination device. Unlike less advanced network hubs, a network switch forwards data only to one or multiple devices that need to receive it, rather than broadcasting the same data out of each of its ports. It works on OSI layer 2. Bridge: a device that connects multiple network segments. It works on OSI layers 1 and 2. Hub: for connecting multiple Ethernet devices together and making them act as a single network segment. It has multiple input/output (I/O) ports, in which a signal introduced at the input of any port appears at the output of every port except the original incoming. A hub works at the physical layer (layer 1) of the OSI model. Repeater hubs also participate in collision detection, forwarding a jam signal to all ports if it detects a collision. Hubs are now largely obsolete, having been replaced by network switches except in very old installations or specialized applications. Repeater: an electronic device that receives a signal and retransmits it at a higher level or higher power, or onto the other side of an obstruction, so that the signal can cover longer distances. Multilayer switch: a switch that, in addition to switching on OSI layer 2, provides functionality at higher protocol layers. Protocol converter: a hardware device that converts between two different types of transmission, for interoperation. Bridge router (brouter): a device that works as a bridge and as a router. The brouter routes packets for known protocols and simply forwards all other packets as a bridge would. Proxy server: computer network service which allows clients to make indirect network connections to other network services. Firewall: a piece of hardware or software put on the network to prevent some communications forbidden by the network policy. A firewall typically establishes a barrier between a trusted, secure internal network and another outside network, such as the Internet, that is assumed to not be secure or trusted. 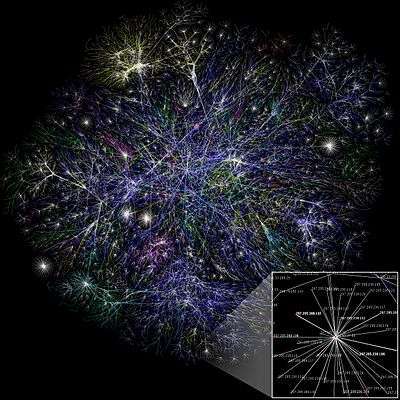 Network address translator (NAT): network service (provided as hardware or as software) that converts internal to external network addresses and vice versa. Multiplexer: a device that selects only one signal from several electrical input signals. Network interface controller (NIC): a device connecting a computer to a wire-based computer network. Wireless network interface controller: a device connecting the attached computer to a radio-based computer network. Modem: device that modulates an analog "carrier" signal (such as sound) to encode digital information, and that also demodulates such a carrier signal to decode the transmitted information. Used (for example) when a computer communicates with another computer over a telephone network. ISDN terminal adapter (TA): a specialized gateway for ISDN. Line driver: a device to increase transmission distance by amplifying the signal; used in base-band networks only. ↑ "ATIS Telecom Glossary". www.atis.org. Retrieved 2016-02-12. ↑ "The TCP/IP Guide - Overview Of Key Routing Protocol Concepts: Architectures, Protocol Types, Algorithms and Metrics". www.tcpipguide.com. Retrieved 2016-02-12. ↑ "Hubs Versus Switches – Understand the tradeoffs" (PDF). ccontrols.com. 2002. Retrieved 2013-12-10. ↑ E., Decker,; A., Rijsinghani,; K., McCloghrie,; P., Langille,. "Definitions of Managed Objects for Bridges". tools.ietf.org. Retrieved 2016-02-12. ↑ Dean, Tamara (2010). Network+ Guide to Networks. Delmar. pp. 256–257. ↑ "bridge router Definition from PC Magazine Encyclopedia". www.pcmag.com. Retrieved 2016-02-12. ↑ Oppliger, Rolf (May 1997). "Internet Security: FIREWALLS and BEYOND". Communications of the ACM. 40 (5): 94. doi:10.1145/253769.253802. Wikimedia Commons has media related to Network hardware.